How do I discontinue Items? Marking a SKU Discontinued removes the Item from default searches. Discontinued SKUs will be removed from inventory reports when the On Hand quantity reaches zero. Once a SKU is marked Discontinued, it also makes all Safety Stock 'Available'. You can use our Bulk Editing Feature to mark Multiple Items as Discontinued at the same time. 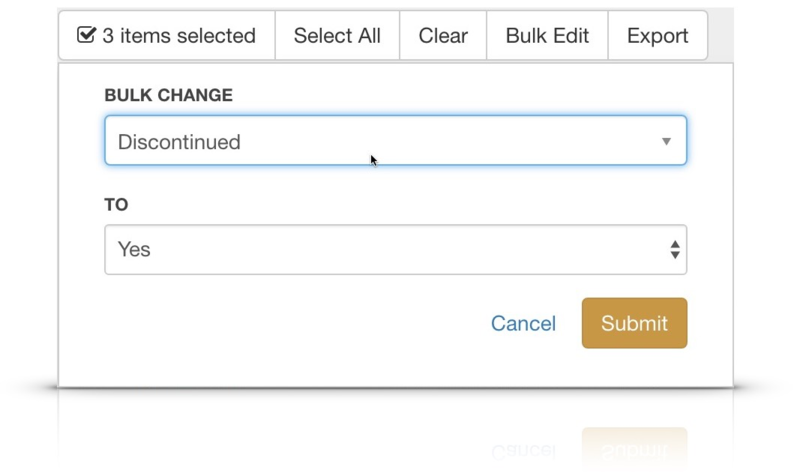 Just select the items you wish to Discontinue and click Bulk Edit. Under the Bulk Change menu, Select Discontinued and set to Yes. After hitting Submit, your Items will be Bulk Discontinued.